The next waves of disruptive technology — AI, robotics, virtual reality, IoT and sharing economy platforms — will create an enormous degree of labor displacement. To appreciate the scale of blue-collar displacement ahead from driverless vehicles alone, for instance, consider that driving is the single largest occupation of US men today. Algorithms have uprooted white-collar work in the financial sector (high-frequency trading) and are starting to do so in health care (mobile health apps, robotic surgery, diagnoses by algorithm). Algorithms are writing articles indistinguishable from those written by humans and have even recently composed a musical play. Not all jobs will be affected, and not all affected jobs will be eliminated – as always, automation will both replace and supplement human labor – but jobs that are truly untouched will be the exception rather than the norm. The gig economy. The rise of platforms such as Uber, Airbnb, Etsy, Didi Kuaidi, Deliveroo and TaskRabbit has already spawned a gig economy in which non-employee freelancers provide labor in temporary assignments. The machine economy. The next stage of disruption will be driven by AI and robotics: the mass disruption of labor and the rise of the machine economy. We are in the early stages of these shifts, and it’s hard to know exactly how they will play out. History shows that automation surprises us with new sectors and forms of employment. Just as digital disruption spawned jobs for web designers and app developers, the machine economy is likely to generate jobs, companies and even entire sectors that we are unable to envision today. Disrupting business. The disruption of work is already spawning business model innovation. The ultimate resource that companies will use more efficiently is the human resource. Just as disruption unbundled music albums into songs, it will unbundle jobs into tasks, with each task performed in the most efficient manner. Disrupting government. Gig economy start-ups are already challenging regulations governing the operation of hotels, restaurants, taxis and more. As the trend accelerates in the machine economy, governments will need regulatory regimes designed for the future – nimble, real-time and powered by big data and smart technologies. Disrupting society. Income inequality could be greatly exacerbated by wholesale labor displacement and by the dismantling of key elements of the social safety net – requiring new solutions. Meanwhile, the machine economy promises to deliver an unprecedented “leisure dividend,” with profound social implications. Intuit, Intuit 2020 Report: Twenty Trends that will Reshape the Next Decade (2010). 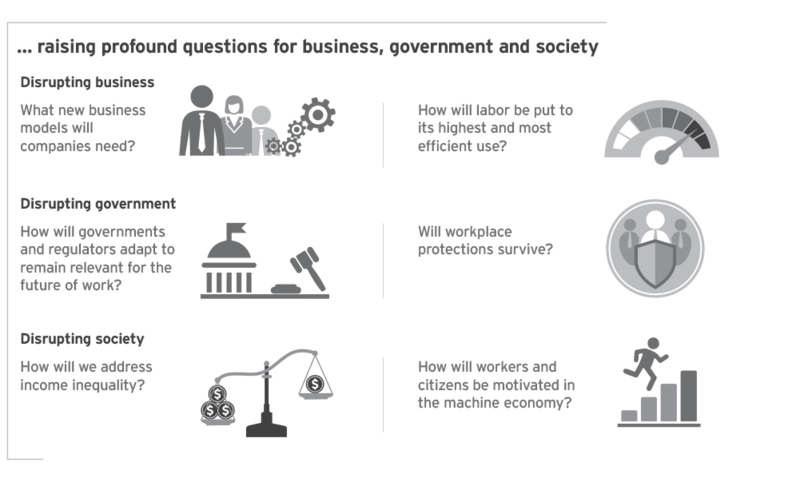 World Economic Forum, The Future of Jobs Employment, Skills and Workforce Strategy for the Fourth Industrial Revolution (2016).